There are so many things to do and see while in Costa Rica that it is impossible cram it all into one trip. Fortunately, Costa Rica is so fabulous that you will definitely want to return more than once. Between national parks, volcanoes, waterfalls, rainforests, cloud forests, underground cave systems, more than 300 beaches, hot springs, animal sanctuaries, exquisite diving destinations, and adventure parks, there is always something new and exciting to do. With so many intriguing options, it is helpful to know what some of the best and must-visit attractions are. The Arenal Volcano is a truly picturesque volcano. If you can imagine how you would have drawn a volcano when you were a kid, that is basically what it looks like: a perfect symmetrical cone. Surrounding the volcano are lush forests that are bursting with wildlife. There are beautiful waterfalls, hanging bridges, hiking and horseback riding trails, butterfly gardens, hot springs, and zip lines tours. 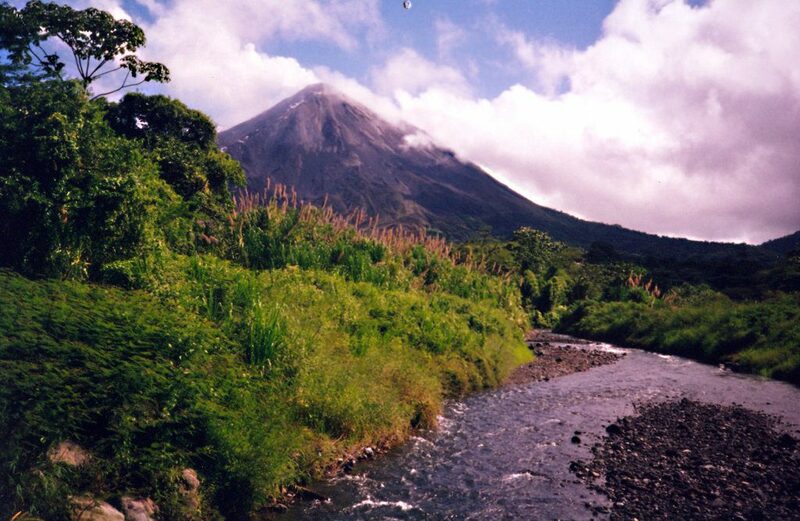 The Arenal Volcano National Park pretty much has it all. 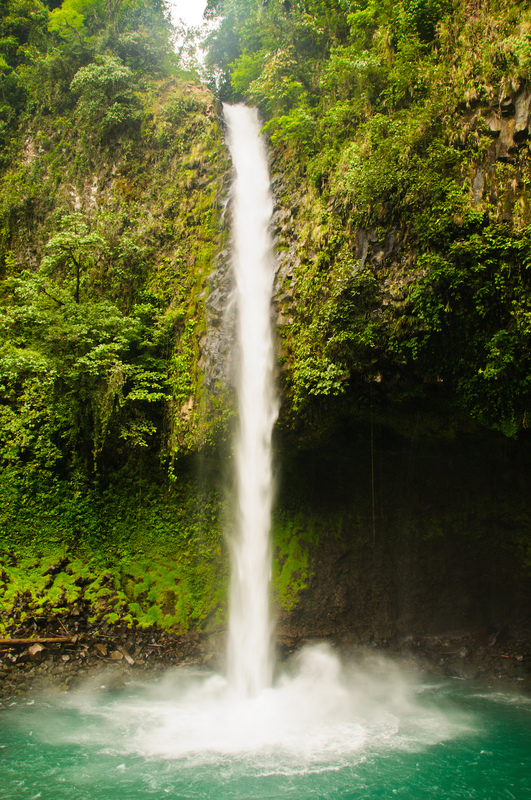 The La Fortuna Waterfall is one of the top waterfalls to visit in Costa Rica. There are multiple ways to get to the hiking trail, one being via horseback, where you will then walk down 500 steps to the basin of the waterfall; La Fortuna Waterfall is 230 feet (70 meters) high! The raw power of this waterfall is mesmerizing. After hiking down, you can swim in the pool beneath the cascade of water, which is an incredible experience in and of itself. The surrounding forest is stunning and it is likely that you will see toucans, butterflies, monkeys, and sloths. La Paz Waterfall Gardens Nature Park is a privately owned nature sanctuary close to San Jose. There are five waterfalls, cloud forests and rainforests, a snake, frog, orchid, and heliconia exhibit, a petting “zoo,” a hummingbird garden, and an animal sanctuary with over 100 different species including jaguars, ocelots, monkeys, and pumas. This is an exciting attraction for the whole family and a perfect way to experience some of the natural wonders of Costa Rica all in one convenient and beautiful place. Tabacon Hot Springs is the largest accessible network of natural hot springs in Costa Rica. The pools are located within a private rainforest reserve and part of the Tabacon Thermal Resort. You don’t have to stay there in order to use the hot springs, though: you can purchase a day pass. The highly mineralized and naturally heated water flows through the resort and fills multiple pools that vary in temperature. It is quite a relaxing experience to soak in a natural hot tub in the midst of lush landscape up in the mountains. In 1945, by a total accident, the Venado Caves were discovered by a farmer who literally fell into them. There are eight magnificent chambers that make up a maze of limestone deep down in the earth. The rooms, which are filled with stalagmites and stalactites, were carved over the course of millions of years from underground rivers and the shifting plates of the Earth near the Arenal Volcano. This is not an experience for those who are claustrophobic. However, if small spaces don’t faze you and you want to dip down below sea level to these ancient caverns, then checking out the Venado Caves is a must-do. La Selva Biological Station and Reserve is on a protected 3,700-acre piece of land that is home to some incredible biodiversity, especially birds. The station is also home to almost 300 visiting students and scientists. The combination of this being a learning and research center, protected reserve, and eco-tourism hot spot makes this a must-stop place. Out of the 450-plus birds that make Costa Rica their home, either permanently or seasonally, nearly half of them spend time on the La Selva Reserve. This is a spectacular place to experience some of the unique flora and fauna of Costa Rica in such a small zone. The Del Toro waterfall is Costa Rica’s largest and most spectacular waterfall. The sheer magnitude and power of this waterfall that appears out of the dense jungle will surely take your breath away. There are great trails and lookout points throughout the property surrounding the waterfall. Visiting the Del Toro Waterfall is an amazing way to spend the day surrounded by nature. This is also a chance to see an abundance of wildlife. If you are only going to visit one waterfall on your trip, visit this one. Easily accessible from Tamarindo, Playa Flamingo, Conchal, and Papagayo, the Catalinas Islands offer some of the best scuba diving in Costa Rica. This island chain is located off the Nicoya Peninsula in the northwest part of the country. The depth ranges between 18–75 feet (5.4–23 meters) and within this range there is an incredible diversity of wildlife. The islands are famous for their population and variety of rays, as well as tropical fish, sharks, sea turtles, and even sometimes whale sharks and pilot whales. Diving is incredible here all year around. Located just 10 miles (16 kilometers) off of the Osa Peninsula, the Cano Island Biological Reserve is an amazing place to spend the day and go snorkelling. The waters are warm, crystal clear, and teeming with marine life. The coral reefs here are home to a wide variety of tropical fish, rays, and turtles. Just off the reef, it is common to see bottle-nosed dolphins and humpback whales. Violines Island, which is part of the reserve, is a beautiful white sand- and palm tree-lined island where you can kick back and relax after you are done snorkeling. Local legend claims that the reason Rio Celeste is its magical and surreal shade of blue is because when God painted the sky he used the river to clean his paintbrush. While this is probably not the case, seeing this river in person does inspire the imagination. Rio Celeste is part of the Tenorio Volcano National Park. The hike in can be a bit treacherous, especially during the rainy season due to the mud, but it is worth it. You have to see this river and the waterfall that cascades into these magical waters in person. The Poás Volcano National Park is one of the most visited volcanic parks and for a very good reason: The Poás volcano is the largest and most active volcano in Costa Rica. It rises 8,885 feet (2,708 meters) high, with a main crater filled with a stunning blue-green colored lake called Laguna Botas. Surrounding the volcanic area, there are multiple different ecosystems, including cloud forests, rainforests, and low mountain forests, which are home to 79 species of birds and a lot of small mammals. There are well maintained and marked hiking trails in the park, too. Manuel Antonio National Park is one of Costa Rica’s most famous parks, and one that should definitely not be missed. There are 1,680 acres of rainforests containing hiking trails that will take you through dense vegetation and out to white sand beaches. This is an incredibly picturesque place that is filled with all sorts of plants and animals – if you are on a search to see a three-toed sloth, this is where you will most likely find one. When you picture Costa Rica, you are probably picturing Manuel Antonio. Walk across six suspension bridges that are pushing 800 feet (245 meters) long and 25 storys high above the lush and lively rainforest in Quepos. The view from the bridges is unmatched by any other; the feeling of being so high up in the treetops where most of the rainforest inhabitants live is truly phenomenal. Just before you get to the first bridge, you will encounter a beautiful waterfall and natural swimming pool where you can take a dip and cool off. This zone is bursting with wildlife, especially birds, amphibians, reptiles, and small mammals like monkeys. There is a section of Rio Tárcoles that is especially famous for its abundance of very large American crocodiles. You can walk out onto a bridge and look down to see dozens of massive crocodiles laying on the embankment or just floating at the surface; a view that is straight out of a nightmare! You will pass this bridge when you are driving from San Jose toward Jaco Beach. You can’t miss it because you will see plenty of people on the side of the bridge admiring these ancient beasts. Giant stone spheres were first discovered in the southern Caribbean region of Costa Rica in the 1930s. Some of the stones weight as much as 16 tons, so it is a great mystery as to who made them and how they got all over the country. There have been over 300 of them found, yet no one is really sure how they were made; though it is thought that some may be up to 1,000 years old. The quarries where the type of stone that these spheres are made from are at least 50 miles (80 kilometers) from any of the giant stones that have been discovered. You can see these mysterious balls at El Sitio Museo Finca 6 in Palmar Sur. The Lankester Botanical Gardens, located in the Central Valley, is home to 15,000 orchids and 3,000 other types of plants. This impressive and gorgeous botanical garden is a must-visit for plant and orchid enthusiasts, or anyone who just loves being surrounded by flowers. Since the 1940s, these gardens have been thriving and attracting visitors from all over the country and the world. Also, due to all of the flowering plants, there is quite a large population of butterflies and birds that make their home here. The Butterfly Conservatory is located in El Castillo at the east end of Lake Arenal and has the biggest collection of butterflies in Costa Rica. There are six different atriums that mimic the natural habits of the variety of butterflies that live here. The beautiful and giant blue morpho butterfly can be seen here. There is a fabulous educational tour that takes you through the atriums where you will learn all about the different moths and butterflies of Costa Rica, along with the frogs and insects, too. This is a lovely afternoon activity; who doesn’t want to be surrounded by butterflies? In 2008, San Lucas Island was declared a national wildlife preserve, but prior to that – between 1873–1991 – it was the most feared prison in Costa Rica. For those interested in eerie pasts and landmarks, this is an interesting historical site. The old prison still sits on this island. San Lucas Island is located off the coast of Puntarenas and is accessible by boat. When walking around this island, it is common to see white-tailed deer, armadillos, boa constrictors, pythons, raccoons and pigs, along with 40 species of birds. There are also five pristine beaches on the island that you can explore. For being such a haunted place in the past, this island is full of life and beauty now. The National Theater is a marvelous architectural and cultural attraction in San Jose. This iconic Neoclassical building is as beautiful on the outside as it is on the inside. Inside there are exquisite murals and interior decorations. The theater hosts all sorts of different live performances ranging from theatrical plays to concerts. If you are in San Jose, you should definitely visit the National Theater for its architectural and interior beauty and definitely try and see a live performance there, if the timing is right.